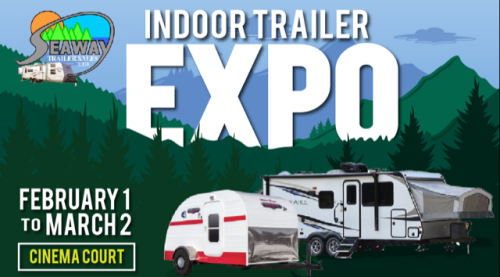 The 2019 Seaway Trailers RV Expo is underway at the Seaway Mall from February 1 to March 2. This year Seaway Trailers has moved in 44 RVs & trailers to help you pick up the perfect travelling companion. There will be a wide range of brands available saving you the time of travelling to various dealers to find your perfect fit. If you are new to RV’ing, come in and compare RVs and trailers and get a feel for the variety that Seaway Trailers can offer to you. DATES & TIMES Feb 1 through to March 2, 2019. Monday – Friday from 10am to 9pm Saturday from 9:30 – 5:30 Sunday from 11am – 5pm Seaway Trailer Sales Ltd. has been a trailer dealer for over 40 years. Our RV Dealership is large enough to serve you or needs and small enough to care.